I really didn’t know if I wanted to read this. It sounded so horrific. But I rather enjoyed Nakamura’s first novel in English, The Thief, so I thought maybe this might be okay. Okay? It’s a terrific novel – better than The Thief, more nuanced, more sophisticated in structure, more complex in plotting – also more tragic. This book might suggest Nakamura’s name as a 21st century Kafka, but I see influences of Dostoevsky as well, and possibly Camus. Warning – it is very dark. That sets the stage but too bad – Fumihiro had already been thinking about killing his father. The toys he carries are a “mask” – easily seen through. And then Fumiori’s father messes with Kaori prompting Fumiori’s great need to protect her. He does, but how can he now avoid becoming the cancer he was raised to be? This book raises lots and lots of philosophical questions and psychological dilemmas. It’s as though Nakamura dreamed up a scenario in which it would be necessary to kill someone and then ponders how one lives with the awareness of that. Nature vs nurture (or lack of it) come into play as well. Fumihiro has other much older siblings and a nephew – his mother is deceased and he’s never met any of them. The idea that he’s to be a cancer weighs on him and he is determined to fight it – mainly by becoming darker and more powerful than his father. It looks like he’ll do it. Nakamura uses lots of words on these subjects – some showing historical examples. Nakamura is a master of suspense – This is not really a “who done it” but a “what-is-he-going-to-do?” suspense for the crime. There are several detectives involved , each working for a different party. And there are other issues – a 21st century brand of nihilism, war and capitalist greed. 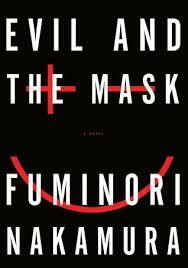 In some ways Nakamura’s book bears certain resemblances to 1Q84 and The Wind-Up Bird Chronicle by Haruki Murakami. There is an underground group of radical revolutionaries (or something), references to Japan’s misdeeds in WWII China and some very surreal goings on. Murakami is a favorite so I’ll likely be watching for more translations from the pen of Nakamura. The themes – well, there’s Karma vs free will with nature and nurture included. Another theme is that you can’t ever quite escape yourself – no matter how good your mask.